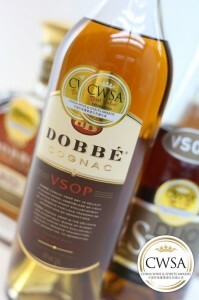 COGNAC DOBBÉ will participate to the exhibition WSWA in Las Vegas from 18th to 21th April 2016 at Cesar Palace, Las Vegas – USA. DOBBE COGNAC will participate to the exhibition from 24 to 26 May 2016 at VINEXPO Hong Kong, Hall 3 Stand JK50-8. Cognac DOBBÉ will participate to TFWA Exhibition from 2 to 7 October 2016 in Cannes, France. DOBBE COGNAC will participate to the exhibition from 13rd to 15th March 2016 at Düsseldorf, Germany. Internation Trade Fair Wines and Spirits, Hall 12 / Stand B24 – A NEW SPACE ! Come discover our full range. DOBBE COGNAC will participate to the exhibition from 10th to 14th May 2015 at Singapore, Asia. 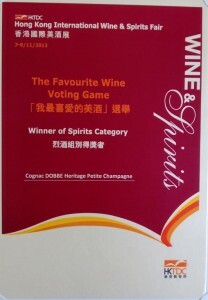 DOBBE COGNAC are delighted to announce that they have won a DOUBLE GOLD medal at the biggest and most prestigious wine & spirits competition in Hong Kong and China for Dobbé Cognac VSOP and a Gold medal for Dobbé Cognac XO Grand Century. Travel with China Airelines and taste DOBBE Cognac ! China Airelines has selected DOBBE COGNAC Cigar tubes (50ml X 3) XO, VSOP and VS Cognac. Have a look on Sky Boutique before booking your flight on all China Airlines flights. This exclusive gift box was created to taste 2 Cognacs of our premium range: Dobbé Cognac VS – the passport to a full-flavoured world in 500ml & Dobbé Cognac VSOP – A delicious pleasure in 500ml. Travel with Air France and taste a DOBBE Cognac ! In 2014, world best sommelier Olivier Poussier has selected DOBBE COGNAC VSOP to be served to passengers onboard all Air France flights. 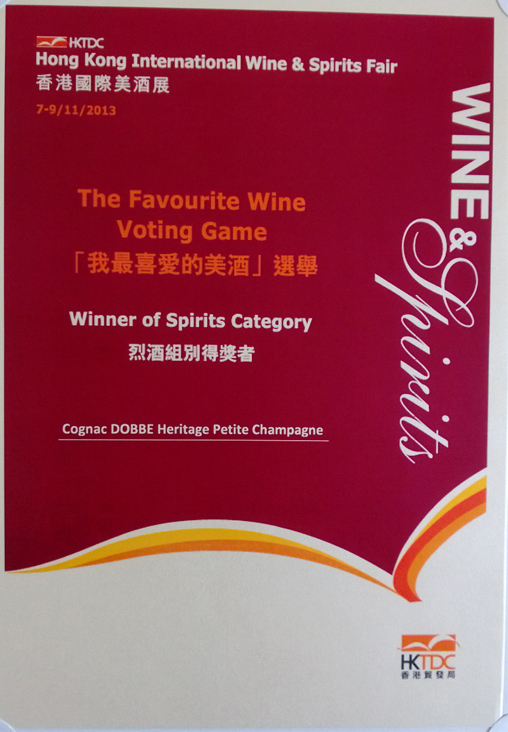 The Winner of Spirits Category, during the Hong Kong International Wine & Spirits Fair (HKTDC) have been announced and we have won with Cognac HERITAGE Petite Champagne The Certificate of the Favorite Wine & Spirits Voting Game ! Legal notices Site map Design by Beezart Excessive drinking is dangerous for health. Drink in moderation. Vous devez avoir l'âge légal de consommer de l'alcool pour entrer sur ce site. Чтобы принять участие вы должны быть совершеннолетним чтобы употреблять алкоголь.